(Eagle River, WI. April to October 2013) All the retirement articles say don’t make changes too quickly. Change only 8% of your life at a time. I hear what they’re saying. It makes sense. It’s less clear how a person can do what’s in their best interest and still follow these guidelines. I would learn by doing. Right from the start, being retired made me feel off balance. Being a get-up-in-the-morning and get-to-work type of person continuously for over thirty years, it was unsettling to have no structure. So I’d get up early, hit the shower and get dressed. Then I had nothing to do and no place to go. A newly retired friend said she went someplace every day even if it was just to sit in a coffee shop and read the paper for an hour. That seemed so insignificant after a work life of constant deadlines, meetings and projects to complete. Within a week, the ex-husband was calling and we slowly and then not so slowly returned to our old ways. The only difference was that we lived in separate houses. He’d come to my place and I to his. We returned to our customary road trips, movies, out to lunch or dinner. We talked every day. He said he wanted to talk about us but seemed to be waiting for me and I was strangely hesitant. He brought out the list he’d made when contemplating divorce, a list of my deficiencies. What kind of a man writes such a list? What kind of man keeps such a list all this time? I was pretty sure he was checking his list to see what I’d corrected. Then, I couldn’t shake the thought that I was just convenient, someone he already knew so he didn’t have to start all over with a stranger. I deserve better than that. When we’d divorced, he had to get a mortgage to buy out my interest in our house. He knew I still had that money and I couldn’t help but wonder if he saw this as a short cut. Get back together and then I’ll buy back into the house. We were clearly not on the same page but limped along, at an impasse, for about three months. Just as it occurred to me that without his daily contact, I’d be pretty bored and lonely in this godforsaken place, our reconciliation was done. The relief of no longer having to meet his standards blended with the shock of being all alone once again. I’d taken a couple of short trips downstate and felt more at home there. Having lived in the Milwaukee area before, still having friends there and being closer to family in Madison made the decision easy. The where was easy, the how a bit more complicated. I wanted to live in a senior community. That way I wouldn’t be completely alone. In my preliminary search I’d found that often these facilities were on freeway frontage roads or plunked down in the middle of a field. I wanted a neighborhood. I knew which locations I wanted, did an internet search and I picked some that looked good in Wauwatosa, Brookfield and Waukesha. In early August, I made arrangements to stay with my friend, Betty and made appointments for showings. The beginning of my search, the first place I visited was on the Honey Creek Parkway in Wauwatosa. Following the GPS directions led me down a wooded, residential road. By the time I saw the building, an old school, I was in love. The facility was older but well maintained. The people friendly. The location just right. I asked Betty to come and see it; I wanted another set of eyes. I worried I was being hasty; shouldn’t I look at more places before making such a huge decision. The next day we saw the actual apartment that was available. It was perfect. I signed a lease that day and returned to Eagle River with a plan. I couldn’t move in before the end of September and this gave me two months to make arrangements and pack. Also plenty of time to perseverate. Which I did. So began the most stressful time of wondering, doubting, planning and thinking. I made myself physically sick worrying. Tumms, Immodium and Tylenol every day. The intricacies of pulling off an over 300 mile move all alone seemed daunting. I’d never used a professional long distance mover before. The man came over to give me an estimate and nonchalantly entered my move into his I-pad. Just another day at the office for him but a monumental event for me. Thanks to my old work habit of writing lists, my master list helped me feel in control as I looked it over and decided what could be done each day. It felt good to check things off. As in past moves, I knew it got easier once things were taken off the walls and other personal items boxed up. Home became depersonalized, little more than a roof and four walls. I sold a few things and took others to a consignment shop, gave away books and clothes. The days ticked away. I said goodbye to my book group, writing group, poker group, the UU fellowship and had my last lunch with my old boss. The cards and flowers from each event filled my kitchen counter. Lovely. Retirement issues had been put aside since all my energy was focused on the move. I thought long and hard about what I was doing. I realized that previously, all my moves had been toward something. A new job. A new town. Exciting new opportunities. This time was different. I was moving away, going into the unknown. As packing progressed and the pieces began to fall into place, the feelings of failure, sadness, closure and change were slowly being replaced by hopefulness. The day before the move, I packed my car with things that were fragile: computer, stereo, etc. I called the mover to check and the crew was expected before noon the next day. I hung up the phone with the eerie feeling of excitement; there was also the anxiety of having no idea how the next day and all the days after that would work out. I was as ready as I’d ever be. (Fall, 2012) I’d never heard of rustic roads until living in Vilas County where I discovered one quite by accident. Today, on a Saturday afternoon, as the leaves had just begun to change color, I and a friend purposely re-routed our road trip to Hanson Lake north of Boulder Junction to take in the pleasures of this leisurely drive. On this truly rustic of the rustic roads, there are no shoulders so tree branches sometimes brush the windshield and the side of the car as we take in the mature forest of oversize trees; the forest canopy creates a tunnel. That day, the foliage was thick with tree tops almost completely joined, blocking out the sky. The sun was to the west as the afternoon lengthened and low level light filtered through the leaves and branches making shadows appear ghostly yet welcoming. At the beginning of the road where it meets Hwy N, is a small, rectangular road sign that’s brown with yellow lettering. It says: Rustic Road, R-60, next 13 miles. The R-60 means it’s the 60th rustic road established. My love of this road and its specialness, made me wonder what it takes to become a rustic road. The DOT has very specific guidelines. It must have “outstanding natural features” such as “rugged terrain,” “native vegetation” and “wildlife.” It needs to be a lightly traveled access road, be a minimum of two miles in length and connect with major highways at both ends. It can be dirt, gravel or paved, one-way or two-way with a maximum speed limit of 45 miles per hour. The Wisconsin Department of Transportation web-site devotes a page to rustic roads entitled: “A Positive Step Backward.” That describes the theory. Step back in time. Slow down and enjoy the journey. It’s also a stark reminder of our need to look ahead and to look backward at the same time. We will then appreciate what we have and also realize we may not always have it. Wisconsin is the only state in the union where the rustic road designation is found. Several other states, Colorado, Nebraska, Iowa to name a few, have described scenic byways as roadways with “unusual or distinctive, scenic, historical, archeological, natural, recreational or cultural features.” There’s quite a difference between this grand portrayal that includes every kind of road imaginable and the focus and uniqueness of the rustic road. Rustic roads began when Earl Skagen, the highway commissioner of Racine Wisconsin noticed “progress” while driving to work on his favorite road, Maple Lane near Burlington. Since building roads was his job, he could see clearly how bulldozers could and would end forever his leisurely drive to and from work. 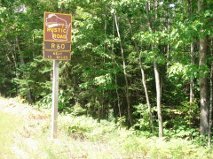 So, he became an activist and through his efforts, the Rustic Roads Board was created by the Wisconsin Legislature in 1973. The first rustic road is in Taylor County and Mr. Skagen’s beloved Maple Lane is the second. Now Wisconsin has 111 rustic roads throughout the state but before they existed, there were a smattering of books and articles touting the pleasures of traveling sideroads. Clay Schoenfeld an outdoor columnist for the Wisconsin State Journal wrote an article that expanded into a book in 1966, Sideroads to Somewhere. In 1979 he did a sequel, Down Wisconsin Sideroads. In 1999, William Least Heat-Moon took the ultimate American road trip, travelling the Blue Highways. Those are the roads marked in blue on road maps, what he called the small roads. He wanted to see the real America, took off in his old truck driving only the small roads and then wrote how it felt to stop the world and step back in time. My discovery of R-60 made me appreciate these gems of relaxation and natural beauty. So, when traveling around the state, I’ve been known to take a sudden detour when I see those little brown and yellow signs. And I’m rarely disappointed. Whether called small roads, side roads, scenic byways or blue highways, the rustic road offers a rare opportunity to slow down, take in some natural beauty and enjoy. Thank you Mr. Skagen for having the foresight to see what might be lost and to do your part in preserving it. (October, 2014) The metaphor of doors that open and close, leading to new opportunities in both wanted and unwanted directions hit home for my mother as she approached her ninety sixth birthday. How to negotiate those doors was a challenge she faced in her own way and in her own time. And we, her children, had to go along for the ride. When thinking about the five different homes of my childhood, I realize the only people who used the front door were company, the postman, hopelessly lost strangers and possibly Jehovah’s Witnesses. Was coming in the back door a working class habit? Or, maybe for us kids, it was just the quickest way to the kitchen. It was also the safest route for my sister, known for sneaking in past curfew. For whatever reason, coming in the back door, depositing boots, hanging up coats just felt right. When my parents bought their last house in Madison in the late 1960’s, it had an addition at the back, shaped like a rectangle, about four by eight feet. Like a mudroom or shed. Coming in the back door is complicated since there are actually three doors. The challenge begins with an outside door that doesn’t have a door knob or jamb but a latch that’s pulled up. Then there’s the rickety screen door with faded paint and plastic stapled to each partition. Finally there’s the third door, a nicely carved wooden one with an ornate door knob. Negotiating the varied openings swinging each and every way, it’s a house of cards or an intricate, stretching yoga maneuver to hold each door at just the right angle or they’ll bang against each other and the whole thing falls apart. First timers are perplexed or mesmerized by the Houdini-like balancing act necessary. And I‘d love to have a nickel for each swear word coming from hapless visitors trying to negotiate something as simple as coming in the back door. After many years of frustration, I now know to put down any bags I’m carrying. This allows me to concentrate fully on the various swinging orifices dangling before me. Add to that the annoying bell that Dad, long ago, attached to the actual door. It tinkles just to let anyone within earshot know that someone is making a fool of themselves trying to come in the back door. Each time I visit, negotiating the doors is the easy part. It’s what’s waiting inside that creates the real concern. Mom has three walkers strategically placed throughout the house. One on the front porch. Another in the living room. She also stores a walker in the far end of the shed so she can take it out for her walk. She brags about being able to walk the entire block and I’m quite proud of her myself. She prizes her independence and is hanging on for dear life, I know. But with the exception of the snowiest winter time, my ninety five year old, frail mother is going in and out of the back door, trying to manage her walker and I hope, not being bopped on the head by a swinging door. And that’s’ just one item on our list of concerns. Medication taken regularly and correctly. Proper diet to maintain healthy weight. Ovens left on. You name it. With Mom, it’s imperative to pick your battles. Safety and frugality seem to be intertwined. She characteristically defends her depression era beliefs. That’s why the living room reading lamp is mysteriously turned off each time I return from a ten minute trip to the bathroom. Same with a five minute trip for a cup of tea. It also explains the cracked dishes and worn utensils throughout her kitchen. Then there’s the worn furniture, the faded rugs and the walls that need painting. Buy something new? Never! Waste not, want not. That’s her motto! My mother has means, due to my parent’s lifelong frugality. The mortgage was paid off decades ago and she has no debt. When she says she’s lonely, we talk about her options. I ask how about enjoying life to the fullest; or remind her how lucky she is to have the resources to make such choices. She enjoys people and would no doubt thrive in assisted living. But she pushes aside these suggestions like the slamming of a door. This seems the most classic example of reluctance in the elderly to give up control. We’ve all been there or are on our way there so we understand. I enlist all the metaphors that exist about doors opening and closing, presenting new opportunities and exciting adventures. But, I make no headway. As I leave to return home from my visit, Mom waves good bye and then wheels into the kitchen to whip up a batch of cookies. And I head home feeling much as I do when trying to come in the back door. Six weeks before her ninety-sixth birthday, with winter coming on, Mom made the decision to go to assisted living. Maybe it was the fact that she’d gone to the facility for a seven day “visit” to see if it was what she wanted. Maybe it was that when she returned from seven days of prepared meals, cordial company and a choice of activities she realized how lonely it was to live alone. Maybe it was the pro and con list my brother and sister spent immeasurable time going over with her. Or, maybe it was just time. Once the actual decision was made, she seemed calm. There still are occasional tears and times of sadness but anyone would feel that way as they face changes and losses this big. We all know that as life goes along, the number and variety of doors to navigate become fewer. Perhaps going through this door has left her with only one final door remaining and maybe facing that is the hardest part. (Eagle River, WI. October 16, 2013) After all the anticipation, the waiting, the list checking, when the day finally arrived it took on a life of its own and there was no stopping. I’d finished packing the car to the hilt that morning. To get everything in and still be able to see out the rear view mirror was a challenge. Did I really need all this stuff, I wondered. I’d been told there’d be a small truck coming since mine was the only move. Instead a semi-sized truck backed up the narrow gravel road and parked. The lead mover told me they now had three moves but my schedule was still the same. He also explained he was late because he had to travel some distance to find a scale to weigh the empty truck. He’d then go back and weigh it full in order to determine the cost. Two other men showed up right after him. One walked in with a suitcase that he opened on the floor and plugged in. He warned the men they couldn’t touch anything until he’d done his work. He took out a hand held calculator similar to those I’d seen used by grocery store clerks taking inventory. I heard his innumerable clicks as he walked around the entire apartment. Click, click, click. Everything I owned was a click. Then the printer in his suitcase produced multiple sheets of small yellow tags with the same three digit number and long inventory sheets for my signature. Each man took a sheet and started tagging my belongings before carrying them to the truck. I could see their minds calculating where each piece should go, how to prevent damage and how to conserve space. They’d done this many times before and that made me feel calm. It was odd to just stand there; my job was to stay out of the way. In forty five minutes, my entire world was packed into the truck. Mountains of paper were produced from the little printer. I had to sign as they started and sign again as they finished. They drove off and left me alone in my now completely empty apartment. It was spooky. There was an echo. I stood for a moment at the sliding glass door that opened to the small patio. The back yard was lined by trees. I’d loved the privacy. No more leisurely mornings sitting in my chair listening to the loons fly by. I took one more walk around, left the note for the landlord and keys on the counter, locked the door, got into my car and drove down the gravel road surrounded by trees for the last time. Driving through Eagle River, the five or six blocks that was the main street, it could have been any small town. I passed all the familiar sights, the grocery store, theater, medical clinic, restaurants. Funny, I had no real feelings about leaving this place. Maybe it had never really been home to me. Then began the five hour drive to Betty’s house in Waukesha where I’d spend the night. Next morning I checked in at my new home, got my keys and unloaded my car. I was finished by noon and then nothing to do but wait for the truck. The movers called a couple of times throughout the day to assure me they were on the way. They’d picked up a last minute move or two so that put off their arrival time. Finally, around 3:00pm they pulled up and it took less than an hour to unload. Another round of signing papers and we were done. The actual cost was within $20.00 of the estimate. Nothing broken or bent. I sat in my new living room and thought it surreal that all my furniture and belongings were now in a new place that looked so much like my old place. Maybe unconsciously, I’d had the furniture placed in the same configuration as I’d had in my Eagle River apartment. This was comforting. That night I was unconnected with the world. No phone, TV or internet. That felt strange. I went to bed and slept well. Next day, the cable and phone guy came and connected me. The move turned out to be so quick and easy, it almost felt like it hadn’t happened. But it had. That first morning, I sat in my chair looking out the window toward the soccer field across the street. The trees and the park were a comforting sight. But I knew it was time to finally and fully approach my newest adventure. Retirement loomed ahead as an unknown abyss. What was next and how would I manage it. Time for a new list. (Wauwatosa, WI. November, 2013) Retirement is a state of mind. And my mind was far from comfortable with that concept. Though I’d quit work six month earlier, I’d been preoccupied with other issues. Divorce. Failed reconciliation. Moving. Anything but retirement. With the move completed, I was no longer isolated but in the middle of a vibrant, new community, close to family and friends. After several weeks of unpacking and getting settled, I’d promised myself I wouldn’t fall into my usual pattern of over extending myself. There’s nothing like keeping yourself so busy you don’t have time to think. This time, I really wanted to think. So, I purposely held back, making no decisions, making no promises. I wanted to risk being bored in order to find out what I really wanted to do with the rest of my life. Each day was wide open and I had no idea how to manage that. There were activities in my building and people always around when I walked down to the library to read the paper. I often sat reading in a lounge area at the end of my hallway and was greeted by other residents taking their daily walk. I began to know people’s names and they knew mine. It felt good to become part of this community and when I’d had my quota of social interaction, I’d return to the peace and quiet of my apartment. This was what I’d hoped for. I’d retired from more than thirty years of having schedules, deadlines, expectations and more to do than could be accomplished in the time available. Retirement felt like going cold turkey and I was having the expected reactions. A sort of panic. A kind of emptiness. An out of body experience. I wondered if having a short term project might help. It could be good to have some small thing on my otherwise empty schedule. National Novel Writing Month takes place each November. It’s a program to help writers by setting up a requirement and a deadline so they can get over their writers block or solve the general procrastination that’s so common. They can make a pledge to write a 50,000 word novel during the month. If nothing else, they have a completed first draft at the end. Writing can be done in whatever pattern or combination that works. Write every day. Every other day. Once a week. If it’s done every day, this means a little over 1500 words a day. I’d been a hobby writer for years; it was something I did in my spare time and I’d been published in several newspapers and magazines. I enjoyed it, though I knew I’d never write the great American novel. But, writing more was one thing I’d said I wanted to do in retirement. I wanted to write about the eight years I’d spent in Eagle River. Memoirs writers are encouraged to write while things are still fresh in their mind. Others recommend giving it time, having some emotional distance from the event. What to do. I knew the move to Eagle River had been a mistake and I was awash with thoughts and feelings about the experience. I wanted to cleanse my soul of it. Put it behind me. Transform myself beyond it. Here I was with no structure and this would give me some. And I’d have something to show for it in the end. I decided to give it a try. The list of topics I made was enough to fill each day of the month. Each writing session, I chose a subject and wrote the required amount. This was a good idea instead of trying to write the story chronologically. Certain topics were clearer to me since I’d already thought about them and knew how I felt. I was diligent and felt accomplished each day. About the time I hit 37,000 words, I realized I was tired of the subject. I think that means I had cleansed my soul. What I wrote that month is probably something I’ll never show anyone because it seemed all I was doing was ranting, raving, whining and whimpering. I, no doubt, needed to do that. And It certainly wasn’t a wasted effort because it gave me some closure (hate that word). And now it was time to think of other things. Putting the past in its proper perspective is the first step in being able to move ahead. Time to stop feeling sorry for myself and get on with the rest of my life. Time to think about my future, my retirement and what to do with it. I know what the research says about change. And how long it takes to truly adjust. Buddha would say the lesson is one of patience. Now the real journey can begin. In 2013, I moved to a 55+ apartment community. It didn’t take long for me to see this place as a microcosm of humanity, a gold mine of quirky tales and the struggles of nice people caught in the vortex of time. Aging is, after all, not for the faint hearted. My writing itch went wild with each new interaction and I was struck by both the sad and funny elements to their stories. I knew I had to write. In order to honor the privacy of the residents and still tell the story, I compiled their many personalities into one persona: Maxine, of greeting card fame. Since no one named Maxine lives in the building, I’m sure no one with take my observations personally. I was attracted to this type of setting as a way of adjusting to my new retirement status without being completely alone. There are one hundred apartments and the oldest resident is 103. Longest residency is 27 years. A ninety-nine year old resident runs the exercise program that meets in the building once a week. I kid that I’ve found a place I can age into. But that’s hardly a joke. This facility recently was opened to all ages. “Intergenerational” says the sign outside. While I thought this made for a richer environment, it seems catastrophic for many of the long standing residents. Administration assures them services for seniors won’t be affected. But there’s skepticism. The young renters are mostly students from a nearby professional school. One Maxine frets that she no longer feels safe doing her daily walk throughout the building. Another Maxine says she no longer feels comfortable coming to the coffee shop. So, let’s get this straight. These advanced degree students who do nothing but study and work are dangerous riff-raff? Whenever the topic arises, I say I moved here because it was for all ages. Funny how that subject no longer comes up when I’m around. There was a recent theft from the locked exercise room and certainty the “new people” are to blame. Ignore the fact that many relatives and friends visit and that it’s quite easy to have duplicate keys made. Also, ignore the fact that there’d been a theft before the change. This does little to alter opinions. For sure. it’s those new, young people. The religious fervor of the residents is quite intense. Catholic guilt reigns supreme and while it’s nice that people are so charitable, this doesn’t lead to close relationships. A different opinion is a sacrilege. I’m hesitant to talk about my rather unorthodox belief system. Of this I remain mum. Activities are optional and being new in the building with a relatively empty schedule, I saw a way to meet people and occupy my time; so, I jumped in and attended any and all of them with mixed results. The weekly “current events” meeting looked interesting. I went to the community room and found five or six other residents there. I also found the line-up of walkers that always occupies the edge of the room during any gathering. The activity coordinator runs a video that highlights current news stories of the week. She has to loudly repeat everything on the video for the hearing impaired. No discussion encouraged. None attempted. Half the room nodding off. I felt like I was on the memory impaired unit of a nursing home. I couldn’t get out of there fast enough. Assigned seating is set in stone. One night, a new resident in a wheel chair approached an empty seat only to be told it belonged to a Maxine, who was clearly absent that night. So, she headed toward another empty spot. Though that Maxine wasn’t present either, she was told she couldn’t sit there. I commented that it was already past 7:00 and Maxine obviously wasn’t coming. After a whispered discussion, the woman was grudgingly allowed a place at the table. Not one word was spoken to her the entire evening. That seemed a mean thing for these good Christian’s to do. That woman in the wheel chair hasn’t come to bingo again. Neither have I. Two nights a week there’s a catered dinner in the dining room and I’ve appreciated this chance to socialize at a meal. Added bonus is not having to cook! Again, assigned seating. Over time, I’ve been able to find some like-minded folks and we’ve been seated together. But occasionally friends aren’t there and I’m seated with a challenging conversationalist. Sometimes, a non-conversationalist. Seated alone with one particular Maxine, a sports enthusiast, was particularly challenging. In my feeble attempt to be sociable, I was ready to talk sports though I’m not a fan. “Oh, I don’t know anything about that. I’m just interested in the score.” Silence. Clanking of silverware. Rustling of napkins. “I don’t know about that. I’monly interested in watching the game.” Slience. Clanking of silverware. Rustling of napkins. This Maxine, with so little to say, is an aberration in the Downton Abbey atmosphere of my new home where dirty laundry is hung out for all to see. A small group meets almost nightly and became known as the “wino’s” since they’ve been known to bring a bottle of wine. I found out first hand that they only gossiped and didn’t want to be part of that. After all, l’ll be the subject of similar talk when I’m not present. One Maxine is certain administration is ignoring the wait list, giving the limited indoor parking spots to the new people. I was that new person and she said this while I was present as though I wasn’t even there. I checked with administration and was filled in on this difficult person’s history. Even administration has no boundaries. Maxine, the volunteer librarian, doesn’t get rid of old and worn books because donors might be hurt if they see their books are no longer on the shelf. Another Maxine complains bitterly about the prices in the in-house general store. I get it that since she’s on oxygen, hard of hearing and needs a walker, her rant is about much more than the price of cookies. A middle aged Maxine is sure various men in the building are hitting on her. I guess I live on the Love Boat! It didn’t take me long to figure out that I’d moved from one small town to another. Many residents had lived in Wauwatosa their entire lives, in the one or two houses of their long marriages. When becoming widows they moved to this facility. Two Maxine’s have been friends since kindergarten. Another Maxine welcomed to this facility a member of her fifty year ago wedding party. I’m surrounded by the women’s club belonging, choir singing, church going, bridge playing, missionary performing types. So different from the career oriented more secular groups I was accustomed to. There are other more definite ways I don’t fit in. Many residents have daughters my age and so I’m considered one of the young ones. I rattled a few when I said I was divorced. The good Catholic widows had no idea how to respond to me. I dared not tell them I was actually twice divorced. That might have started an eviction petition. As administration’s annual resident meeting approached, the Maxine’s revved up for a show down. They’re going to “put them on the spot” and “give them a piece of our mind.” The Maxine’s frantically played phone tag to assign a specific question that each would ask. At the meeting of course, there’s only stone faced silence; in the end, the only question asked dealt with caulking the windows. But at the catered dinner the next evening, the grumbling continued unabated. The property owners throw an annual Christmas party for the entire building. Talk on the street, or rather, in the hallway, is that the format has changed this year from a sit-down dinner to a buffet. The Maxine’s are sure this is just another example of how things are changing and a way for the company to cut expenses. Turns out, the buffet was a huge success, was well attended and new friendships began since everyone sat wherever they wanted. Maybe there’s hope. The young people, students, need a study area and use the community room which is always set up for Saturday afternoon Mass. The table that’s the altar is their work area and they return everything to its rightful place when finished. Trouble maker that I am, I suggested to administration that if they want the students to feel welcome here, (that’s money in the bank) perhaps they could put a permanent table at the far end of this underutilized room. While administration thinks this makes sense, it was their eye rolling and worried look that gives me little hope. I can just hear the Maxine’s. How can the altar that’s used for Mass be moved? Isn’t that just another example of how administration says one thing but does another? Who do those students think they are horning in on our space! All I can say is: what would Jesus do? Adjustment to my new home continues. I feel I made the best decision in spite of the differences between myself and most of the residents. I’m still getting to know the neighborhood and my comfort grows daily. I enjoy this place and laugh often at the foibles of myself and others as we navigate the changes inherent in life. But I wonder. Can the comedy of this situation shine through amidst the tragedy of aging and loss of control? I fully accept the “laugh or you’ll cry” dichotomy. Personally, I never want to lose the humorous edge. I also accept the reality that in time I’ll be one of those using a walker, enjoying the current events program, looking forward to Bingo and seeing the annual Christmas party as the highlight of the season. Anyone who says retirement is easy doesn’t know what they’re talking about. So far, I’ve felt best when I was completely involved in the present, preoccupied with my move. How to get everything scheduled and take care of each little detail. This left little time to think about the future. But finally, I’m here and those pressures are off. Now what. Everything so new and strange, I’ve moved hundreds of miles toward a new place and a new life. It felt good to be occupied for the week or two when I was putting things away, organizing my new home and then in November when I wrote every day. But now, I wake up each morning, look around and wonder what I’m doing here. When will I feel more centered? More at peace. How long will this anxiety go on. It’s hard having no place to go each day, no project to work on or anything that needs completion. After working for so long, I can’t seem to break my usual habit of getting up early, showering and getting dressed. But, for what? There’s nothing on my schedule. I don’t have a schedule. I feel out of body. Groundless. Unbalanced. Pema Chodron says groundlessness is based on fear. Fear of change. Fear of the unknown. How can that be for someone who’s already met so many challenges and changes in my life. I’m not a young person just starting out. It’s a mystery why this time seems so different. So difficult. I watched the movie, Back When We Were Grownups, based on the Anne Tyler novel. It’s about a woman who looks back on her life and sees that she’d lived it, not as she’d planned but for other people. Their lack of appreciation makes her feel lonely and she wonders how the rest of her life will be. It made me cry at the point where she’s feeling at her worst. I felt the same. She thinks she doesn’t belong anywhere. I don’t really belong anywhere either. By the end of the movie, she sees that she’s had a good life even though it’s not the one she’d planned to have. That’s how it is, realizing the difference between the life you’d planned and your real life, the one you get. So, what is my real life? Is it still ahead for me? And how will I know when I’ve achieved it? Perhaps I’m on overload, having changed so many things at the same time. Or could it be that change is harder with age. Less options and more needs. The finality is sobering. I honestly didn’t think I’d be alone at this stage of my life and that’s added more to the mix. It’s the abyss. I can’t see what’s out there. Or, even if there is anything out there. Refraining, the second step, is maybe the hardest. I was already doing it, had made that decision to go slow and not clutter up my new life. I just didn’t know there was a word for it. So, maybe that means I’m normal and what’s happening to me is the usual, the expected. I’m no different than anyone else and have to go through this just as everyone does. I’m going to refrain for a while. This unbalanced feeling is my new reality. My job is to figure out what I wanted the rest of my life to be. Getting to know myself in a new place of my choosing. I’m going to be groundless for a while. (Wauwatosa, January, 2014) The first winter of my retirement was moving along nicely until that Monday morning in January. Sometimes it’s those simple naturel events that can be both jarring and thought provoking. I woke to the sounds of the wind howling and pulled back the shade. Looking out to the soccer field across the street, I saw that mountains of snow had fallen over night. The big, white, fluffy flakes were thick as the wind swirled them in the air. The weather channel said this was only the beginning. The swirling outside matched the spinning in my head as I recalled more than thirty years of braving any kind of the weather to get to my oh so important jobs. This morning, my initial feeling was a gut tightening worry. Then, I stopped short and got a grip on reality. I realized this was the first time I didn’t have to get up and go to work in a blizzard. My very first time! Mixed in with the delight were shades of other days and past anxieties. I’d lived in Michigan’s Upper Peninsula where Lake Superior was just the right distance away for storms to dump its lake effect snow on us. Hence the name Big Snow Country. The lake effect snow was deceiving. It’s so light and airy as it hits the ground. But it mounts up just the same. It was common to get eighteen inches overnight and like nothing to have snowfall in that range three or more times per week. It was just part of everyday life. I remember many times being awakened at 3:00am by the faraway rumble of the snowplow. I’d never missed work because of the weather in the fifteen years I lived there. Main highways and roads to the ski hills were the first to be plowed. But another wrinkle was added when I took a job in White Pine. No longer on the main roads, in pitch darkness, I drove a two lane county trunk highway and many times I never passed another car during the entire trip. I see now how dangerous this was. Who would have found me if I’d gone off the road into a snow bank. I recall my return to calm, seeing in the distance, the blinking light for the turn into White Pine. What a relief; I’d made it another day. Each county in Upper Michigan decided which time zone to adopt. Those near the Wisconsin border chose central time. So, I lived in a county in the central time zone and worked in a county in the eastern time zone. This meant I’d have to leave for work at 6:00am central time to get to work by 7:00am central time which at my job was 8:00am eastern time. The hour gained when I returned home at night wasn’t much consolation. All this to get to another oh so important job. Residuals of living in Michigan’s Upper Peninsula, where we got 200 to 300 inches of snow each and every year, still descend upon me every fall. My mood goes down, down, down. Even though it’s been thirty years since I left there. Every fall, the enjoyment of this great season is muted as I mentally get ready for winter. Those feelings surfaced again when I lived in Eagle River where we got a fair amount of snow but not the lake effect kind. It was the more usual Wisconsin wet, heavy kind. The roads were plowed but nowhere near as efficiently as in the UP. And the city didn’t get around to plowing streets for several days, making driving through town more of a challenge than on the highway. In this rural, small town there was nothing but isolation when the power went out or the storm raged on. Living on a dead end gravel road with no street lights or neighbors was daunting. Would I be okay? Would someone know I’m here all alone? A blizzard in a city is much different than the one’s I’d experienced in the remote places of my past. Now, I’m in a large building, surrounded by other people just like me. And the city takes care of everything. I felt so safe and smug. This only reinforced the wisdom of my decision several months ago to move here. My perspective about those oh so important jobs has changed too. I can see now that missing one day would’ve made very little difference. Perhaps it’s hard to accept how really unimportant we are. I could have played sick or lazy or anything and the world would have gone on. Darn that work ethic. I’m relieved that I’ll never have to worry about those things again. The snow was beautiful that day. So white and clean. I’d never enjoyed this weather phenomenon so much before, seeing it for the beauty it is instead of as a barrier or a challenge. With all these thoughts and memories still flying around in my head, I settled in for a day at home. As if there wasn’t enough to worry about. All the changes, challenges and mysteries about retirement, everything turned upside down and all this new stuff to figure out. Now this. It all started on the first day of each month. Somehow these things just appeared. Then there’s more on the second Wednesday. I don’t have to do anything to make it happen. And there’s no way to stop it. Nor would I want to. It’s like a miracle. But instead of feeling happy, I was apprehensive. The monthly, magical appearance of money into my savings account seemed spooky. I was still in my pajamas, just sitting at my computer, checking my on-line bank statement, wondering what I’d do today. And there is was! This seemed just too good to be true. Did I deserve this? Perhaps I’m reacting to old memories of my parents who were frugal products of the depression. Always saving and living within their means. I remember, in high school I had to put half of my baby-sitting money into the bank and Dad diligently checked my ledger each month. When I started baby-sitting and earning some money, my parents promptly stopped my allowance saying they had five other children they needed to provide for. From then on, I bought my own tooth paste and hair spray. Though resentful at the time. I was able to pay tuition for my first year of college without taking out loans. Then after college there were years of living “hand to mouth” as they say when I let the credit card bug give me the false illusion of deep pockets and feed my extravagant tastes. I chuckle now as I recall the bill paying ritual I performed each payday. I’d end up with a stack of envelopes each containing a check for the minimum amount that left barely enough for day to day expenses. Perhaps it was Dad’s early example that got me to finally cut up those cards and take control of my money and my life. I also knew money was power in a relationship. So in both of my marriages, we kept money separate. When it’s a couple with no children, that’s easy to do. No one looking over my shoulder asking what I was writing that check for. Or what was that bill all about that came in the mail the other day. Just as he could buy whatever he wanted, so could I. We always paid mutual bills on time and never fought over money. Very early in my career, I began to take advantage of every employer’s long term saving plan. I realized quickly that most of what ended up in my IRA’s was what I’d contributed myself. Luckily, I had a few employers with great matching programs and I took full advantage of them. I savored the day when I transferred those various accounts into just one. The amount seemed huge. I guess that small, consistent saving does pay off in the end. Finally, my county job gave me a small government pension which, now, are almost non-existent in private business. This combination of resources added up to a nice amount. I felt so fortunate. Money is a formidable thing. All the articles, programs and commercials on TV seem to reinforce this thought. How much will you need to retire, asks the man standing near a labyrinth looking graph as people extend a tape out from the center. Hardly anyone makes it to the edge of the circle. The Fidelity green line chases the hard working professional from kitchen to patio imploring them to save. Experts say you’ll need a certain percentage of your working income to continue in your present life style. Now that I’m there, it’s hard to believe how well I’m getting along with so little. Humph, I say, to those purveyors of fear and worry as I look ahead. My entire income goes into one savings account and each month I only spend what magically appears there. Any money left over at the end of each month gets transferred to my long term savings account. This makes budgeting simple. My IRA’s are off on their own continuing to grow and it’s a relief to know they’re there for some unforeseen emergency or health crisis. With the ease of on-line banking and electronic deposits, I write two checks a month. Rent and my hair dresser. Life is simple. My time as a task-oriented professional accustomed to earning their way has been replaced by a retired woman who can finally reap the results of many years of hard work and saving. It’s weird to no longer need that six month emergency fund that’s recommended to stave off financial ruin in case of job loss or illness. But, I still can’t spend it. I’m finally getting it that the money that miraculously appears each month will come in for the rest of my life. I worked hard for it. I deserve it! I once had a husband who was a world class napper. After mowing the lawn or reading a book, he’d head for the living room couch and be asleep before his head hit the pillow. Steady breathing and soft snoring made it clear that he was out, really out. I’d sit and marvel, wishing I could do that. Then fifteen to twenty minutes later, as though an alarm had gone off in his head, he’d open his eyes and within a minute be on his feet and out the door. Novice napper that I am, I was excited to begin this new adventure now that I’d quit working. My move to a new town and retirement left me with old issues resolved and a new life beginning. At first, I found myself needing to lie down as often as three times a day; this overwhelming tiredness descended upon me and I just had to take a break. Was I finally really relaxing, no longer having to worry about job-related projects or deadlines? Perhaps I was finally resolving old unfinished issues. But I couldn’t nap. As soon as I was in a prone position, I was wide awake.I often sat by my window wondering what was going on, why was napping harder than I’d imagined? I had to have answers. What did we do before Google? And that’s where I found some interesting facts and insights about napping. More than 85% of mammals are what’s called “polyphasic” sleepers; that means they sleep for short periods throughout the day and night. Humans are part of a mammal minority who are “monophasic” sleepers, meaning that our days are divided into two distinct periods, one for sleep and one for wakefulness. As a nation, the United States is becoming more and more sleep deprived; while naps can’s substitute for poor quality nighttime sleep, a short 20-30 minute nap can help to improve mood, alertness and performance. If you’re a napper, you’re in good company: Winston Churchill, John F. Kennedy, Ronald Reagan, Napoleon, Albert Einstein, Thomas Edison and George W. Bush were all known to value an afternoon nap. Hum. Interesting that the list contains only men. Wonder what that means. But a more refined Google search revealed that Eleanor Roosevelt was the only woman included in this revered company. No wonder she’s one of my hero’s. Further Google research led me to the types of naps and the benefits and perils of this activity. There are planned naps, taken before you actually get sleepy, a good idea for times when you know you’ll be up later than usual. Emergency napping is when you’re suddenly very tired and can’t continue whatever you’re doing; this can happen when driving fatigue or repetitive use of heavy machinery makes you suddenly drowsy. Then there’s habitual napping, taken at the same time each day. Young children and older adults are known to take a short nap after lunch and napping is an important facet of day-to-day life in many cultures. Benefits of naps include the improvement of short term alertness and performance without leaving you feeling groggy or interfering with nighttime sleep. But of course, the benefits are offset by their negative effects. For example, some people have trouble sleeping any place other than their own bed or simply have trouble sleeping in the daytime. They’ll probably never be good nappers. Naps can lead to sleep inertia, defined as the feeling of grogginess and disorientation that comes with waking from a deep sleep. One study indicated that napping is associated with increased risk of heart failure in people already at risk. And finally, while napping is a beneficial way to relieve tiredness, it still has stigmas associated with laziness. My general sleep patterns had gone all awry since no longer having to get up at the crack of dawn for work. Still, I’d be awake at 5:30am on the dot. The internal sleep clock and the circadian rhythms were noted on Google. For me, napping during the day often prevented a good night’s sleep. I’d find myself wide awake and frustrated at 1:00am. After a time of unsettled sleep and daytime tiredness, I finally made peace with this as well as other adjustments to the unstructured world of retirement. I now accept that it no longer matters when I get my sleep. A fond memory of sleeping until noon while a college student has been relegated to the annals of the past as something I’ll never be able to do again. As the sleep clinics recommend, when I awaken at odd hours, I get up and watch TV or read until I get tired. I found that if I stay up until midnight, I sleep straight through until 6:30am. And I do that sometimes. But if I’m so tried I can’t keep my eyes open at 9:00pm, I go to bed knowing I’ll be up at 2:00am. When this happens, I simply sigh and get busy until I’m tired and return to bed. Why fight it! With these up and down sleep patterns, I feel like I’m napping day and night. I’ve joined the majority of mammals as a polyphasic sleeper; I always have a reading or writing project handy for those late night sojourns and early morning burst of energy. I’ve come to accept this new-found freedom in retirement; I now am more than satisfied to mix up time to my best advantage and enjoy. That’s the art of the nap.